· To promote and propagate safety awareness in mines, National Safety Award (Mines), National Conference on Safety in mines is organized by Directorate General of Mines Safety. The recommendations of National Conference on Safety in Mines go a long way in enhancing safety of mine workers. · Workers participation and sensitization in matters of safety are ensured through training in safety and by initiatives like celebration of safety week and safety campaigns, etc. · Safety training programmes are organized among Managers and Supervisors for improving safety standards in mines. · Risk Assessment Techniques are being introduced aimed at elimination of risks and to ensure safety of workmen. · Standard operating procedures are established to avoid unsafe practices in mines. · A special safety awareness campaign has been launched to increase awareness of mine workers, i.e. ‘Safety is My Responsibility’ and steps have been taken to propagate the same. CIL has established a structured multi-disciplinary Internal Safety Organization (ISO) to assist the line management at various levels in matters related to Safety. · Risk Assessment & Safety Management Plan: CIL has introduced risk assessment based Safety Management Plan in its mines. It is an on-going cyclical process. 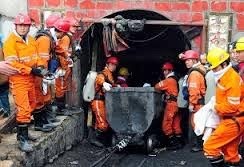 · Safety Audit of the mines is being conducted time to time. · To check Inundation/ in rush water: Thrust on Risk assessment, Safety Audit, Check Survey, Trials of Geo-physical Methods for detection of water bodies / proving parting etc. · Use of Gas Chromatograph to analyze mine air sampling with better accuracy. · Use of Local Methane Detector (LMD) for early and accurate detection of methane belowground for highly gassy mine. · Risk assessment for identifying hazards related to spontaneous heating / fire potential. · Stress on face mechanization to reduce exposure of workmen in active working zone. · Support Plan based on Rock-mass-rating (RMR) of over-lying roof strata. · Greater use of Roof Bolting for roof support. · Introduction of mechanized drilling by the advanced roof bolting machines. · Introduction of resin capsules particularly for watery seams. · Emphasis on development of indicators for detecting impending load on roof through R&D. · One laboratory has been commissioned at CMPDI, Ranchi for testing of physical and chemical properties of capsules. · Surface miners are being used in several opencast mines of CIL, which are safe and eco-friendly. · Mine-specific Traffic Rules have been framed and circulated. · Code of Practices for HEMM operators, Maintenance staffs & others. · Standard Operating Procedure related to safe operation of various mining operations. · Safety Management Plan based on Risk Assessment for every opencast have been prepared and implemented. · Training of Contractor’s Workers involved in transporting jobs. · Introduced Simulation based training for tipper & dumper operators / HEMM operator. Special Safety Drives are conducted periodically to assess the level of compliance of safety norms each mine. Annual safety fortnight is also conducted once every year for the same purpose. · Special training programme for safety officers and other key mining officials directly engaged in ensuring safety at mine by the SIMTARS, Australia accredited trainers. · Several R&D projects on safety have also been initiated. · High-wall mining has been started at Sharda Opencast Mine of SECL, which is safe mining system. Spreading knowledge and coal mine safety related information through publication of quarterly safety bulletin from CIL. This information was given by the Minister of State for Coal, Shri PratikPrakash Bapu Patil in a written reply in Rajya Sabha today.